Mt. Zion is a place where you can find many different expressions of worship. We believe in worshiping God with our whole heart which engages our spirit, soul and body. The scripture is filled with examples and instructions on how to touch the heart of God with our worship. We understand that everyone is unique in their personality and give room for all to express their worship freely in accordance with the scripture. Mt. Zion's worship team is made up of several individuals that rotate leading the worship service which gives us a variety of music selections from traditional hymns to the up-beat contemporary style of modern music. Some of our favorite selections come from Chris Tomlin, Kari Jobe, Paul Baloche, Hillsong, Vineyard Music and much more. We simply love to worship and want an atmosphere where you spend time in God's presence, honor Him, touch God's heart and let Him touch yours. Come as you are, leave a renewed person! Flags are simply instruments of expression similar to any other instrument or art form. They are used as symbols of expression of our inward worship. 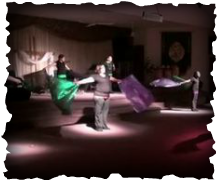 The visual effect can be very moving and encourage one to enter into worship. Scripture gives many examples of the use of flags in time of war, victory, and worship. 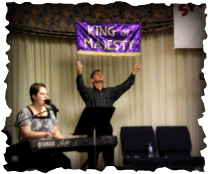 To Give Honor – When we wave our instrument, we minister in love to our King and proclaim the magnificence of Who He is. We declare a name and an aspect of God's character. To Declare Our Allegiance – When we wave our instruments in worship, we admit our loyalty as members of our Lord's army. We do this in the presence of men on earth and before powers and principalities in the heavens. To Communicate – As a flag is raised, the prayers over it, the colors used, and the words or symbols on it are used in speaking to our Lord in the aspect of His character depicted in the flag. We ask Him to reveal Himself and related matters of His heart to us. For example, if a flag exalts Him as Jehovah Roi (The Lord Our Shepherd), we are asking to speak to Him who leads, protect, and comforts us. Perhaps our hearts are crying out to Him to bring us to that place of restoration, or to show us specific direction for a situation. We ask, and then await His response. To Signal the Presence of God - Lifting flags in worship is symbolic of the action of Moses as he lifted his rod (a shepherd's staff, a symbol of a flag) as a visible sign of God's presence, power and authority over the enemy. To Rally the Troops - We know our battle is not against flesh and blood, but against rulers, powers and spiritual forces of wickedness in the heavenly places (Eph.6) . Raising a flag stirs unityand loyalty in the King's army, gathers warriors together for strategy and strengthens our commitment to victory. To Declare Territory – Matthew 18:20 (NKJV) tell us, “ For where two or three are gathered together in My name, I am there in the midst of them.” By claiming territory in the name of Jesus and asking Holy Spirit to purify, to bind and cast out any and all demons and evil spirits, we establish our Spiritual boundaries. When we do not do this we are leaving our selves open to the realm of the enemy. 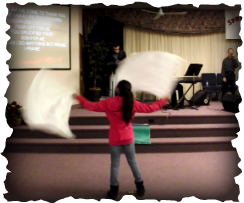 With the flags, we claim our territory and ask Holy Spirit for protection. To Direct Warfare and Praise - Early records show that in ancient Egyptians battles, soldiers looked to flags(ribbons or fabric tied to poles) to determine the direction of the wind, then shot their arrows accordingly to reach their target. In terms of spiritual warfare, a particular flag might be flown in the physical realm to reveal what is happening in the spiritual: it relates the direction of the "wind" of the Holy Spirit on a particular day. To Put the Enemy to Flight – Isaiah 59:19 tells us, "...When the enemy comes in like a flood, the Spirit of the Lord will lift up a standard against him." 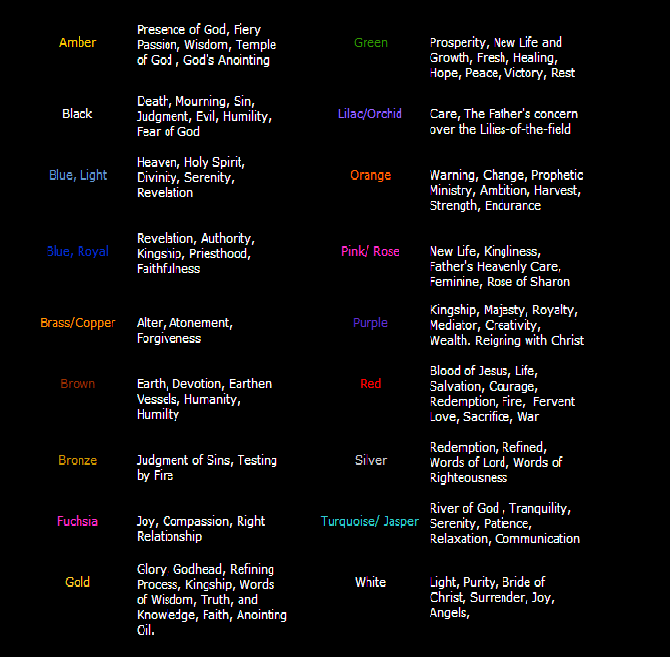 Flags are God-given, God anointed, Word-based instruments that display His truth. Truth and light cause the enemy to flee. "Nuwc" is a Hebrew word which means “lift up a standard." To Boast of Victory - Another Hebrew word for banner is "dagal" and the definition of it is "to flaunt, be conspicuous, and set up with banners." Ps. 20:7 says "we will boast in the name of the Lord." To Be a Touchpoint of Faith - God directed Moses to put a bronze serpent on a pole as a focal point and promised that whoever would have faith enough to look on it would be healed of the deadly serpents' bites in the wilderness. As we look to the Cross in faith, we find healing in the blood of Jesus. Flags are not idols and do not contain healing, nor any other manifested gift of God, but serve the Body of Christ as a visual reminders of His faithfulness as Jehovah Rophe, the God Our Healer, or Jehovah Shalom, The Lord Our Peace, or any of the wonderful qualities of El Shaddai, the All Sufficient God, God Almighty. To Herald an Event - Flags declare a specific event or season. 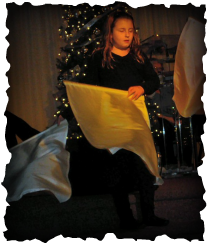 Through the use of flags in worship, the Bride of Christ is announcing in the spirit of Elijah and John the Baptist, “The King is coming! Prepare the way of the Lord!” "
Download the Video Performance of All of Creation.